2019 APTA Honors and Awards Program Recipients Announced! Congratulations to the following AGPT Members! We are proud of you! Award recipients will be recognized during the Honors & Awards Ceremony, tentatively scheduled for Thursday, June 13, 5:30–6:30 pm, at the NEXT 2019 Conference and Exposition in Chicago, Illinois. A reception will immediately follow the ceremony. Emerging Technologies to Support an Aging Population is a Report by the Task Force on Research and Development for Technology to Support Aging Adults, Committee on Technology of the National Science and Technology Council. The report identifies a range of emerging technologies that have significant potential to assist older adults, and it is offered as a guide for both public and private sector research and development (R&D) to improve the quality of life, enhance individual choice, reduce caregiver stress, and cut healthcare costs. The Task Force identified six primary functional capabilities as being critical to individuals who wish to maintain their independence as they age and for which technology may have a positive impact. Key Activities of Independent Living. Living independently requires the ability to perform of a range of activities that impact our daily lives. Many of these activities can be assisted through technology, including those that support good nutrition, hygiene, and medication management. Cognition. Cognitive changes are common during aging, with increasing prevalence at older ages—varying in severity and impact. These changes can affect the ability to live independently as well as personal safety. Technology holds the promise to help older adults monitor changes in their cognition, provide mental training to reduce the impact ofthese changes, and create systems that assist individuals and families to maintain financial security. Communication and Social Connectivity. Older adults may face communication challenges as the result of hearing loss, social isolation, and loneliness, especially in economically distressed and ruralcommunities.Technologycanimprovehearingandstrengthenconnectionstolargercommunities. Personal Mobility. Mobility is a key factor in successful aging. To live independently, an individual must have the ability to comfortably and safely move around the home and throughout the larger community. Technology can assist older adults in staying mobile and able to safely perform key activities necessary for day-to-day life as well as interact with their communities. Transportation. True independence requires mobility outside of the home and neighborhood. Transportation needs and limitations are dictated to an extent by the changes to individual physical and cognitive abilities that come with age. While some older adults remain completely independent and continue to drive without assistance, others may be able to drive but require vehicle modification and/or advanced technologies to assist them while operating a vehicle. New technologies could also help older adults more safely and easily use public transportation. Access to Healthcare. Access to healthcare plays a critical role in helping older adults stay active and independent as they age. Activities and strategies that support the maintenance of function and independence with age are multifaceted. Alignment and coordination of these efforts through technology can increase the effectiveness and efficiency of these services. Each primary capability is divided into a group of focus areas. Each focus area includes a set of key functional needs that are ripe for innovative technology solutions, followed by a bulleted list of recommended R&D topics needed to develop those solutions. In the process of identifying primary capabilities and focus areas in which technological advances can have a positive impact in enabling older adults to age in place, several areas emerged that are associated with a number of technological solutions and were therefore not specific to individual R&D recommendations. These areas are included in the final section of the report, Cross-Cutting Themes. Medicare payment system is in the midst of a paradigm shift—away from the fee-for-service payment structure, in which providers are rewarded solely by the volume of services provided, and toward a structure that holds providers accountable for patient outcomes and costs. This move to value-based care is intended to advance the goals of health care's "triple aim"—improving the patient experience of care (including quality and satisfaction), bettering the health of populations, and reducing the per-capita cost of health care. As part of this effort, CMS has finalized significant changes that will affect the home health and skilled nursing facility payment systems—beginning in FY 2020 for SNFs and CY 2020 for home health agencies. These payment systems align payment with patient characteristics and patient needs, and eliminate the connection between therapy utilization and reimbursement. CMS finalized the Skilled Nursing Facility Patient-Driven Payment Model (PDPM) and Home Health Patient-Driven Groupings Model (PDGM) in 2018. APTA staff and members of the Home Health Section Government Affairs committee recorded an overview of the Patient-Driven Groupings Model and recorded 2 live Q&A sessions. Unfortunately, there are a number of myths about these 2 new payment systems, shaping biases and working against the long-term success of these models. We are writing on behalf of the American Physical Therapy Association (APTA) and the Academy of Geriatric Physical Therapy (AGPT), a component of the APTA, in response to the recent Perspective article, Rehabbed to Death, published in the New England Journal of Medicine (NEJM) on January 31, 2019. As representatives of a profession designed to optimize health through movement, we want your readers to know more how health care professionals, including physical therapists, can increase the quality of discharge planning to ensure they contribute to improving the quality of health for patients. Physical therapists play a unique role in society in prevention, wellness, fitness, health promotion, and management of disease and disability by serving as a dynamic bridge between health and health services delivery for individuals across all ages. One of a physical therapist's most essential roles is ensuring appropriate transitions from one setting to the next. Evidence supports that physical therapists make accurate and appropriate discharge recommendations for patients who are acutely ill. Discharge planning can be overwhelming to patients who often are unfamiliar with the fractured long-term services and supports system. Best practice in discharge planning involves a multidisciplinary process and physical therapists are critical to ensuring this process is carried out in the appropriate manner. APTA and AGPT support the authors' conclusion that there is a need for increased interprofessional communication and improved discharge planning. Unfortunately, current payment and coverage policies fail to incentivize interprofessional collaboration and as such, there is very little cohesiveness between different disciplines. To that end, APTA and AGPT strongly believe that discharge planning teams must be interprofessional, include physical therapists, and that physical therapists' recommendations are viewed in the context of patient/caregiver wishes, postacute care regulations, and alternative models of care, including palliative care. An interprofessional team comprised of physicians, nurses, physical therapists, and case managers, among others, as well as the patient and family members/caregivers, can make much more well-informed decisions about post-acute care placement and anticipated care needs. Unfortunately, discharge planning recommendations put forth by physical therapists are routinely omitted from hospital discharge communications to subacute care facilities. It also is critical that the discharge planning team have an accurate and contemporary knowledge base of payer policies governing post-acute care settings and the services each setting offers, particularly for this vulnerable minority of patients who are the focus of this commentary. As the article rightly points out, "In treating discharge to a postacute care facility as a routine event, we are missing an opportunity to improve care for seriously ill older adults." As Doctors of Physical Therapy, physical therapists are trained to provide consultation for transitions of care, particularly from acute care to postacute settings or the home. They also are well-versed in the services provided in a postacute care setting for patients of all ages and understand the rules and regulations governing postacute care admissions and stays. The discharge planning team must recognize the importance of including the patient and his or her family members/caregivers in the discharge planning discussions. Fully incorporating the patient's treatment preferences and goals better prepares patients and their family members/caregivers to be active partners for their anticipated needs upon discharge from the hospital or post-acute setting. Too often, however, alternative care options such as palliative care, which may be preferred by the patient and family members/caregivers, are frequently left out of the discharge discussion. Greater coordination and communication between health care professionals, and the increased inclusion of the patient's and his or her family members/caregivers' goals, desires, and needs may improve patient outcomes. We also feel it is important to highlight the fact that on November 3, 2015, the Centers for Medicare and Medicaid Services (CMS) published a proposal to revise the discharge planning requirements that hospitals, including long-term care hospitals and inpatient rehabilitation facilities, critical access hospitals, and home health agencies, must meet in order to participate in the Medicare and Medicaid programs. CMS sought public comment, consequently determining that there are significant policy issues that need to be resolved in order to address all of the comments submitted in response to the proposed rule. Accordingly, CMS has extended the timeline by which it must publish the final rule to at least November 2019. We expect that this rule, once published, will strongly influence the future of discharge planning. Finally, we wish to correct a misinterpretation of policy discussed in this article. On page 409, the authors state that "Under current regulations, a Medicare-covered short stay in a postacute care facility must be aimed at improvement." In fact, the Jimmo v. Sebelius Settlement Agreement clarified that the Medicare program covers skilled nursing care and skilled therapy services under Medicare's skilled nursing facility, home health, and outpatient therapy benefits when a beneficiary needs skilled care in order to maintain function or to prevent or slow decline or deterioration. Thank you for your time and consideration to publish this letter. Polnaszek B., Mirr J., Roiland R., Hovanes M., and Kind A. Omission of Physical Therapy Recommendations for High-Risk Patients Transitioning from the Hospital to Subacute Care Facilities. https://www.ncbi.nlm.nih.gov/pubmed/26253350 Accessed February 14, 2019. Flint L., David D., and Smith A. Rehabbed to Death. https://www.nejm.org/doi/full/10.1056/NEJMp1809354 Accessed February 14, 2019. Smith B., Fields C., Fernandez, N. Physical Therapists Make Accurate and Appropriate Discharge Recommendations for Patients Who Are Acutely Ill. https://www.ncbi.nlm.nih.gov/pmc/articles/PMC2867215/ Accessed February 14, 2019. The webinar was put together by the Post-Acute Care Educational Collaborative and was done by AGPT and HPA members along with APTA staff. The webinar recording is open to all members and non-members. A new MLN Matters Article MM11081 on Home Health Patient-Driven Groupings Model (PDGM) – Spilt Implementation is available. Learn about the payment reform requirements. A new MLN Matters Article MM11152 on Implementation of the Skilled Nursing Facility (SNF) Patient Driven Payment Model (PDPM) is available. Learn about the required changes. On February 5, the Centers for Medicare and Medicaid Services (CMS) posted on their MDS 3.0 Technical Information Webpage a new draft version (V3.00.0) of the MDS 3.0 Data Specifications. This version is scheduled to become effective October 1, 2019. These specifications are used for software developers and vendors to update SNF PPS grouper, MDS, electronic health record, and billing systems to align with annual updates to the MDS-RAI (yet to be issued) and SNF PPS billing requirements. Note that there are many significant changes, to align with the transition to the new Skilled Nursing Facility Prospective Payment System (SNF PPS) from the Resource Utilization Groups, Version 4 (RUG-IV) to the Patient Driven Payment Model (PDPM). These changes include the removal of eight RUG-IV assessment item sets (NS, NSD, NO, NOD, SS, SSD, SO, SOD), the addition of two new PDPM assessment item sets (IPA – Interim Payment Assessment and OSA – Optional State Assessment), and item additions in Sections A, GG, I, J, O and Z. See this link for the draft MDS 3.0 Item Sets v1.17 for October 1, 2019) that were issued on January 3. The MDS draft data specifications also accommodate the utilization of the PDPM grouper (not issued yet) , which also begins on October 1, 2019. In addition, a new version (V1.04.0) of the MDS 3.0 CAT Specifications was posted. This version is also scheduled to become effective October 1, 2019. The specification for CAT 12 (Nutritional Status) has been updated in accordance with the changes in V3.00.0 of the MDS 3.0 Data Specifications. With aging might come changes in older adults’ ability to get around and do the things they want and need to do. These mobility changes may affect older adults’ health and independence and are related to an increased risk of falls and motor vehicle crashes—the two leading causes of older adult injury. The CDC released a new mobility planning tool to help older adults create a personalized MyMobility Plan. 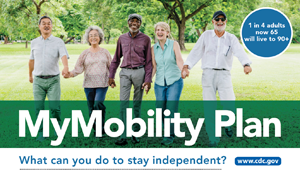 This planning tool, along with a supporting fact sheet about medicines that might increase risk of a fall or motor vehicle crash, helps older adults plan for mobility changes similar to the way that many plan financially for retirement.